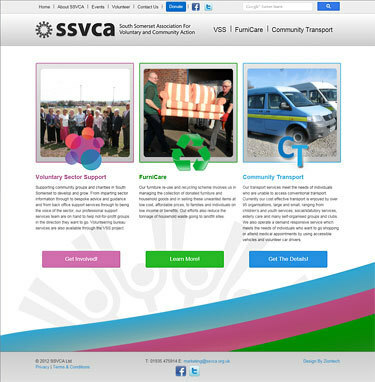 We were approached to design a new web site for SSVCA (which stands for the South Somerset Association for Voluntary and Community Action). The site has 3 sections representing the 3 main aspects of the organisation. Each of these sections has their own colour scheme which is clearly displayed via the text headers, mouseover links etc. The web site includes a ‘sign-up’ facility and users also have the ability to publish events.